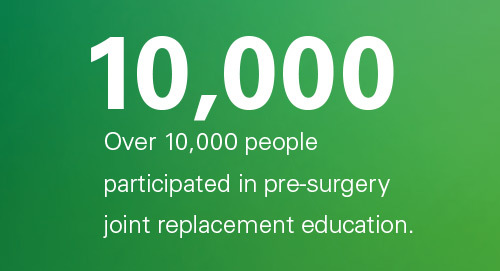 With almost 8,000 joint replacements in 2017, each Sentara OrthoJoint Center® has a singular focus: the needs of orthopedic surgical patients undergoing hip or knee replacement. These 11 centers concentrate their efforts on a dedicated team approach involving nurses, anesthesiologists, surgeons, physical therapists and home care. This centered approach improves both patient care and outcomes. Sentara OrthoJoint Center® continues to offer a unique joint replacement experience. Patients having joint replacement at Sentara grew 9 percent in 2017 (over 2016 volume). A dedicated Orthopedic Patient Navigator at each facility offers to patients the extra benefit of an informed and individualized joint replacement experience. The patient navigator helps foster open lines of communication among the patient, the patient’s family and the care team before, during and after surgery. With education being such an active component for joint replacement patients, the navigators continuously look for additional ways to keep their patients and the coaches informed on the latest clinical information. Ten Ways to Recover at Home. A two-sided document developed to help patients and their surgeons appreciate the advantages of being able to be discharged from the hospital directly to the comforts of home for a continued recovery. This is now included in the patient and family guidebook. This document has since been adapted for other patients outside of orthopedic care. Patient Commitment. 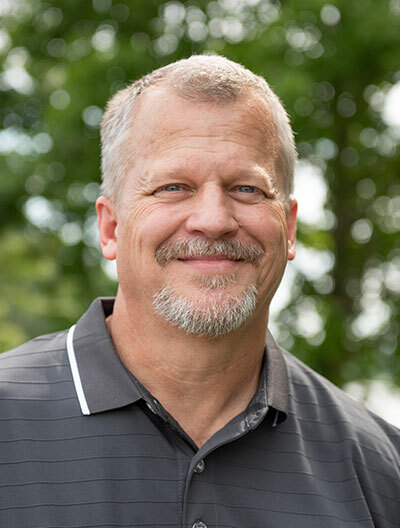 Choosing to have elective orthopedic surgery does come with a commitment from the patient — and a coach — to do their best to learn what they can do to have the very best outcomes. This document bullets out the simple things that can optimize the experience and recovery. StopLight Discharge Poster. With hospital stays after surgery becoming shorter, when patients are discharged to home, they need to know the guidelines for what is normal, what symptoms need to be discussed with a healthcare provider and what needs immediate attention. This is also a part of the patient and family guidebook. Online educational video was developed to offer 24/7 online access to patients and their families about the Sentara OrthoJoint Center® joint replacement experience. It is available at SentaraOrthoJointCenter.com/video. 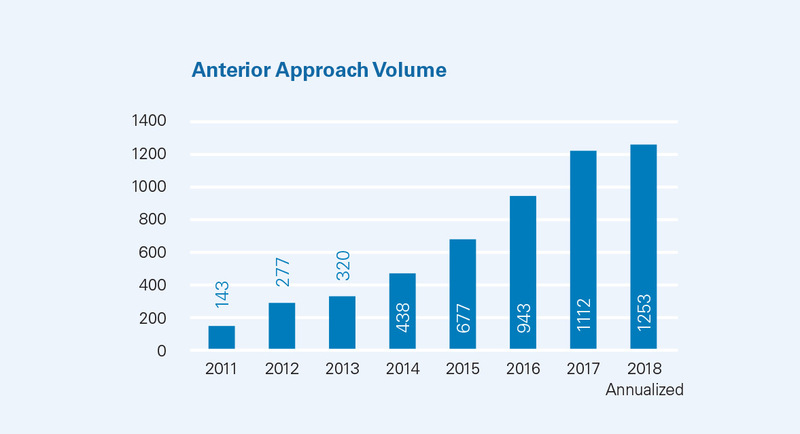 Direct Anterior Hip approach continues to be a growing choice among patients looking to have a hip replacement. There are several techniques used by orthopedic surgeons to perform joint replacements for hips. The direct anterior approach for hip replacement is one minimally invasive option that uses a frontal (anterior) approach to replacing the joint. 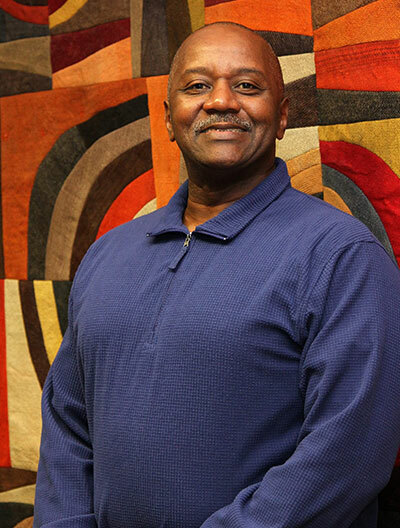 This option for hip replacement continues to grow at Sentara facilities. The trend of shorter length of stays fueled the increased expansion of patients electing to have a one night length of stay in the hospital following joint replacement surgery. This option was initially offered at two locations in 2014, grew to four sites in 2015 and, in 2016, expanded to two additional locations: Sentara Princess Anne Hospital and Sentara Virginia Beach General Hospital. 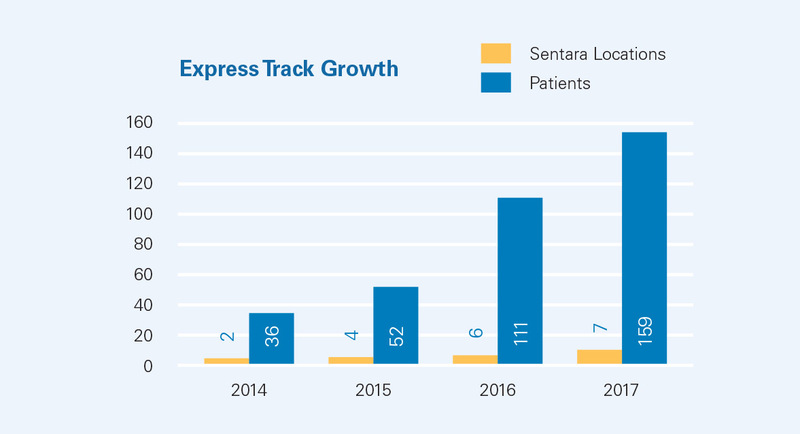 In late 2017, the Express Track option started being offered at Sentara Martha Jefferson Hospital where some patients are already returning home the day of surgery to continue their recovery. Healthy patients interested in a shorter hospital stay are pre-screened by the surgeon before surgery. Selected patients agree to prepare themselves and their coaches for a expedited recovery. Pre-surgery education is imperative in setting expectations. Strengthening exercises are recommend before surgery. Express Track helps healthy patients recover more quickly after joint replacement. Getting patients up and walking the same day of surgery and aggressive physical therapy are key components to the success of the Express Track program. It combines the high quality care of the Sentara OrthoJoint Center® with a shortened hospital stay. Patients leave the hospital the day after or even the day of their joint replacement surgery and continue recovering in the comfort of their own home. They have the option to be visited there by our expert team of home care providers. Express Track is an optional program that requires a commitment on the part of the patient. To prepare for Express Track, patients receive pre-operative education and information, including a best practices guidebook that lets them know what to expect. The guidebook also provides patients with both pre-operative and post-operative exercises and manages their expectations regarding recovery. 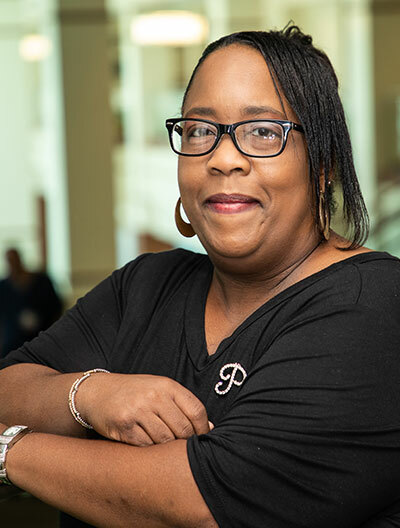 Sentara Patient Navigators are nurses with specialized training in orthopedics, helping them provide an extraordinary level of patient care in their role as liaisons between the patient, the physician and the hospital. The patient navigator assesses patient needs and provides personal, individualized care for each and every patient in the Sentara OrthoJoint Center® and the Sentara Back & Neck Center. Understanding each patient’s medical history and risk factors (making sure, for example, that a patient’s diabetes is being properly managed). Coordinating all aspects of a patient’s care while in the hospital and after they leave. Responsibilities include arranging group physical therapy, providing discharge instructions and following up after the hospital stay. Collaborating together and with the surgeons and other team members to continuously improve the patient experience. Evaluating patient care and looking for ways to improve patient outcomes. Conducting studies to see is simple changes can offer advantages for patients or their families.